Wow! Someone built a miniature Bag End! Its amazing... How someone could have the patience to build it with such meticulous detail, I have no idea. These are fom the past year or two or so. Okay, this takes some explaining... if you think it looks weird you are right. I did this art thing over at the senior high when I was 13 and they said that you had to made the number 11 say something about you. Very.... interesting. So I drew 13 fairies, because I was 13 and have always loved fairies. Each of them are doing things I enjoy: reading, writing, dryawing, acting, being silly, dancing, etc. I had that sword thing from King Arthur because I love myths and legends, the castle because I love fantasy, the AWESOME quote by G.K. Chesterton who has since become one of my favorite authors. I shoved in tons of other references, too. :P I wound up getting third place, which was really weird, because I was like 7th grade and all the other people there were juniors and seniors. 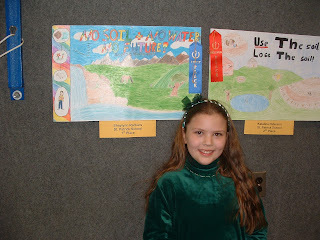 I got a portfolio out of it, which was awesome. I got an iPod touch awhile ago! I was slightly annoyed, though, that the screen could only be used with your finger. Being an artist at heart, I loved the drawing apps. Being big in the bones, I have rather large fingers that made drawing on a four inch screen difficult. 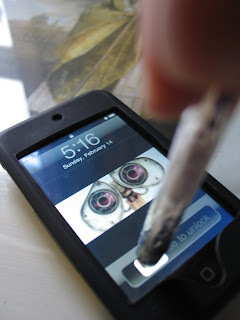 Being a person filled with curiosity, I had to figure out why iPods can't have styluses. That explained why syluses don't work. It needs to be conductive. 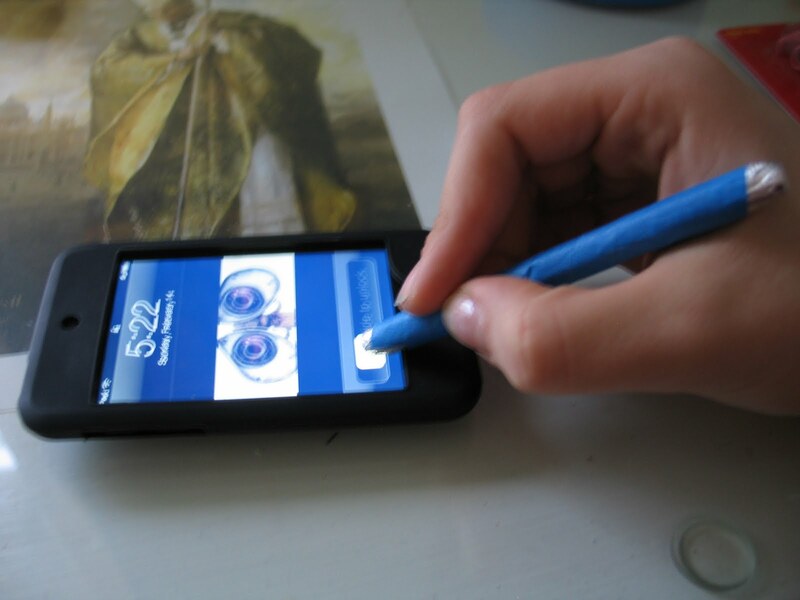 Being a crafty person (in more than on sense... muahaha) I had to make a stylus. That is conductive. Being a person who misses the obvious, I didn't even think to look online and realize that they actually sell nice iPod styluses. Ones that don't have the same problem mine have. It only works if it is touching your hand or skin or a banana. (WHY the banana works? That I don't know. But I did it accidently once. And it worked. Although that might just have been a fluke...). This stylus will be useless with a glove. However, it allows for better control on the screen! This was an experiment; I didn't actually use all supplies shown. My stylus is two-sided. One side is angled, the other flat. 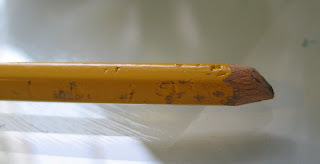 Take your pencil and use the craft knife to cut its tip at an angle. Make sure to round the tip. You don't want any pointy things that can hurt your expensive toy. Make sure that the eraser end has a large enough eraser-- again, you don't want sharp pointy things. Cover both ends with the Wrigley's gum wrappers. Secure with regular Scotch tape. The gum wrappers are a soft foil covered with a thin cushiony substance. It is much softer than aluminum foil and will not harm your iPod. It is also very conductive. 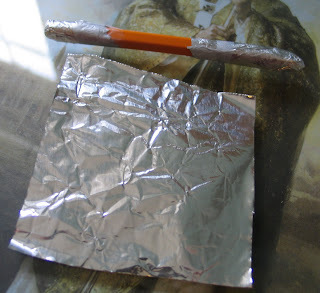 Cut a peice of aluminum foil to cover the pencil. Be sure it reaches the gum wrappers but does not reach the ends. I then tested it out. It does work and does not harm the iPod. I covered mine with blue painter's tape! Voila! A stylus! WIP= Work In Progress. I forget how long ago this drawing was. It was certianly over a year ago. Until we had to clean our house to sell it, I tacked my pictures onto my wall. Partly a show-off display. :P Partly a way to make me continually fix them. You see, if I had to fall asleep looking at them, I would soon get tired of the mistakes, and notice new ones. I kept a pencil by my nightstand and fixed up those little mistakes. Pictures went up and came down for years-- every so often I took a photograph. Here are some pictures of the wall, in no particular order. So! 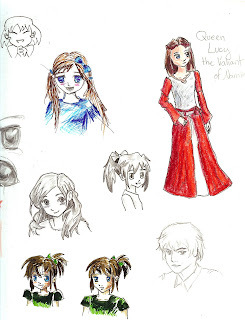 These are some of my old drawings! 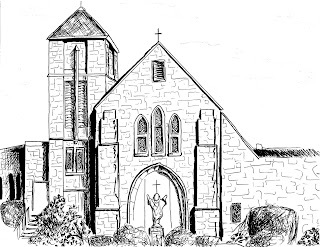 Click to enlarge picture. I've been uncovering more and more old pictures from an undated CD. I really should get more organized and start dating my CDs. Some of the pictures are really, really old. Some of them are from barely 2 years ago. I really don't remember! But here they are! 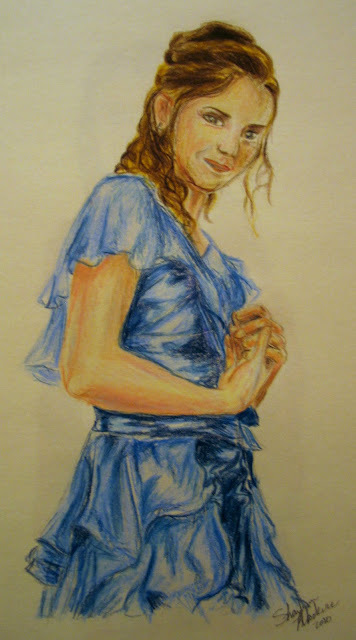 A painting of my sisters' godparent's girl that I never did do-- I tottaly messed it up and gessoed it over. A coloring contest. I was, 11? 12? And I got third place in the 11-18 year old bracket. Actually, its still up on the website! HERE. A painting for a family friend's cousin in Germany who visited us when she was down here in Hillbilly Land. :) Its a drawing of a picture I took when we all went out to Meramac Springs Park. You can see part of a notebook I'd decorated. That contest picture, a drawing of St. George, and a colored-in photocopy of the drawing of St. George. There are going to be plenty of old pictures coming up on my blog. I actually have no idea how long ago I made these... and these files are all undated. They are most likely from two to three years ago. All I remember about these was giving them to a friend. 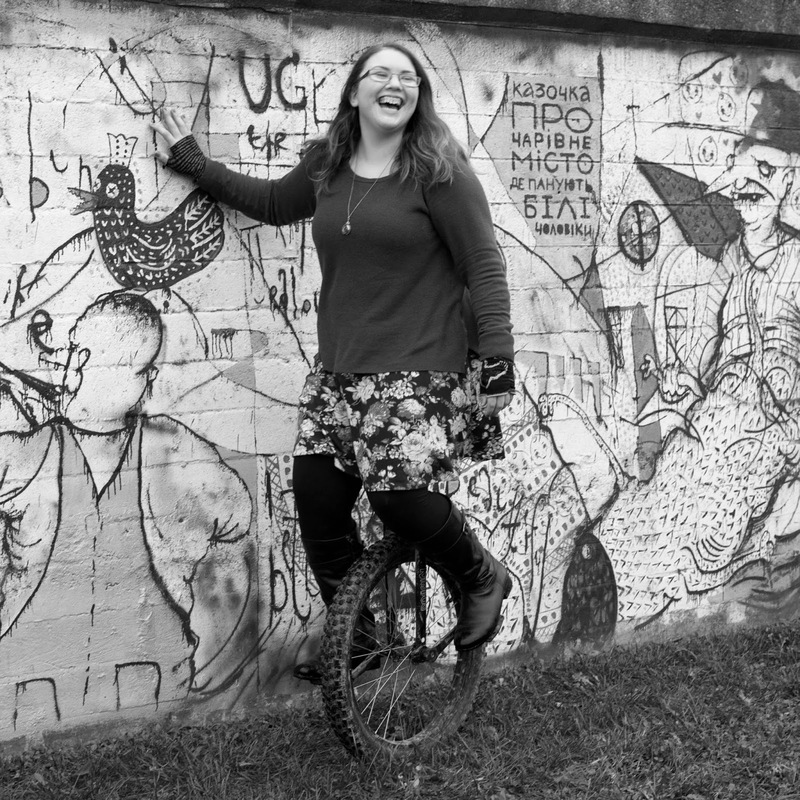 I updated a few posts with new pictures. All the ones that I said, "Hey, I've got more pictures for this laying around somewhere..."
Have you ever found yourself in possesion of a boring nightstand, three dusty dried roses, an idea and no vase? 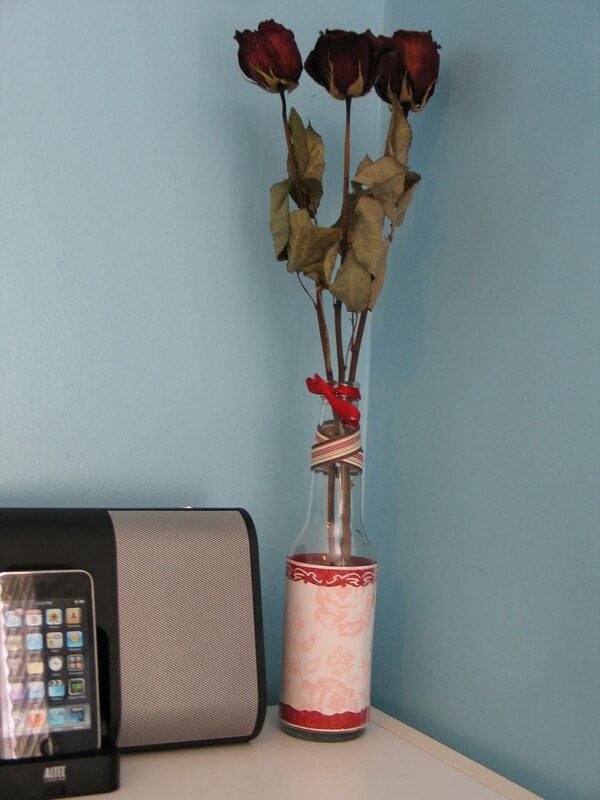 As I had no vase, I decided to use (of all things) a beer bottle. I made sure it didn't have any writing up on the neck. I measured a peice of pretty scrapbook paper and glued on the lacy edges of read paper. 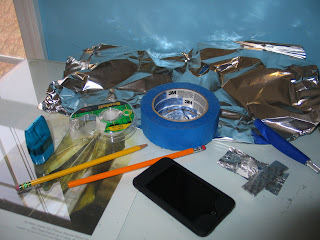 I then used Mod Podge to glue the paper onto the glass. (I can't tell you how much I love mod podge-- I've used it a gazzillion times since we got it). Then I tied some ribbons on. 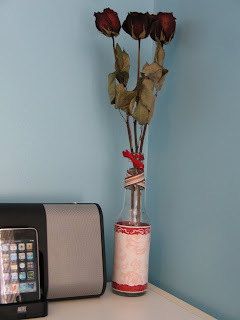 To dry the roses, I simply took a live rose, tied a string to the end, and taped the string to my closet wall (so the rose hung upside down). If you use flowers that aren't already mostly dead, they turn out much prettier than the ones pictured here. Also, if you are not having to show the house, you can tape the flowers so that they hang from your ceiling-- I think thats pretty. :) Oh, be sure to open up the middle petals, so that you don't wind up with mold in the flower. And don't set them behind your shelf absentmindedly. You forget about them and they get dusty. First the scanner wasn't scanning very well. Then I thought I'd simply take pictures of my Lucy and Hermione drawings. I downloaded them, realized the WB setting had been incorrect, and decided to fix that via Paint Shop. Which promptly locked up. Then I had another page to scan in. Our scanner saves images as a TIF. Blogger does not accept TIF. And guess what is the only program we have that changes TIF to JPEG? That's right. THe locked up Paint SHop. Okay, I'm good. Just do it another day. 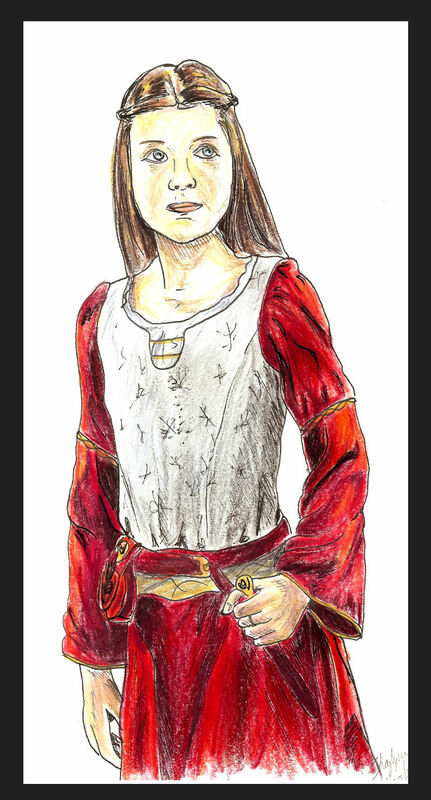 Well, there are many things I like and dislike about this drawing. 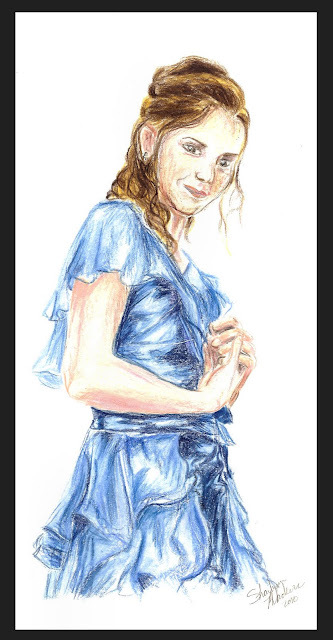 Considering the fact that it is my first full colored pencil face, and I did it off of a small photograph while sitting on the couch at Grandma's (with cousins watching my every pencil movement), I think I did okay. 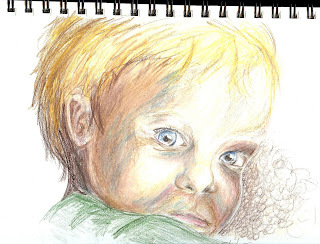 Anyway, it is a drawing of my little brother! And the squiggles on the one side is supposed to be his teddy bear. Excuse me, my sister's teddy bear, which he stole. The photograph is really cute, I snapped it while he was being protective of Mr. Fuzz-Fur. 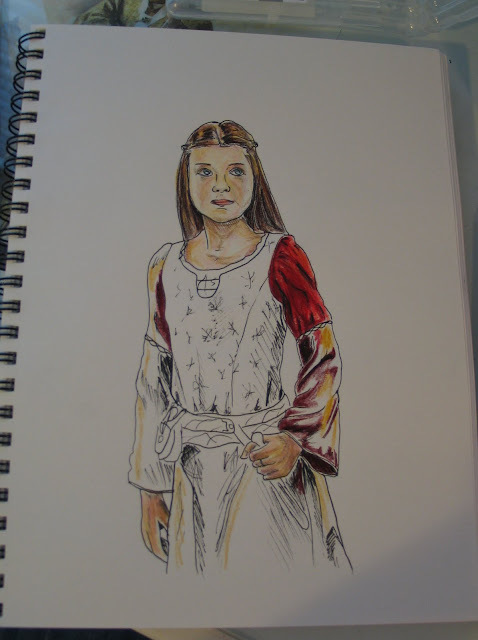 I drew Lucy Pevensie the next day! 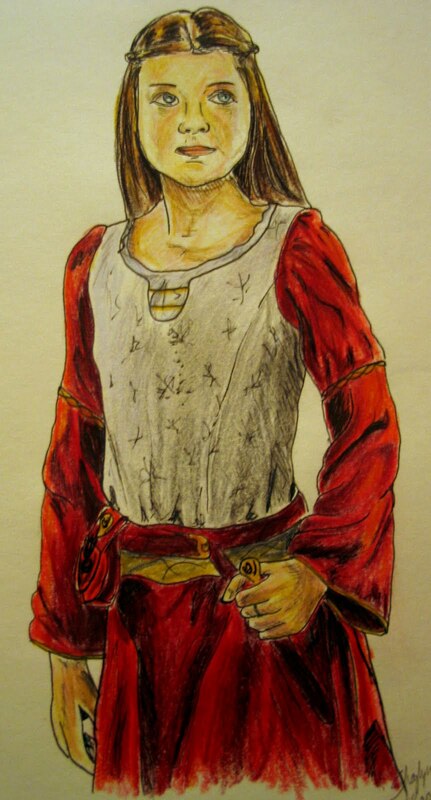 This is my typical colored pencil/pen style. Again, I want to pummel the scanner to death. This scan lost all skin color! And the rich reds! I am quite upset at our scanner; even with the help of Paint Shop, the picture doesn't have the depth of color that my actual drawing has. And the colors that it highlighted are the wrong ones-- it makes the drawing look funny. I have decided to get back to honing my colored pencil skills! 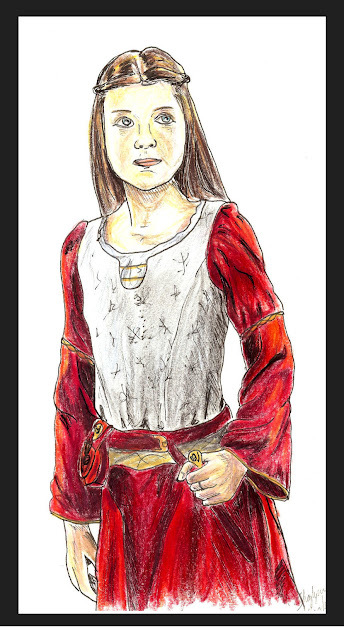 Believe it or not, this is my first colored pencil drawing that does not have any pen lines-- since third grade. Yes, it is true.